Discussion in 'TV on DVD and Blu-ray' started by michael_ks, Oct 25, 2007. Question - considering ordering this as I was a huge fan of the comic strip. Are other characters from the strip.used in the tv series?? Regulus, bretmaverick2, Flashgear and 2 others like this. Thanks for the kind words, Lou! Well deserved for a great show which was so well presented on DVD thanks to you. I hope it has continued to sell for you, and that you can get into the 'black and out of the red " and compensated for all the work you did on it . I hope as well, that maybe some day you can give similar treatment to Terry And The Pirates . If there were more people like Mr. Ellis around , maybe some of the lost programs from TV 's golden age would be made available to us again . Ron1973, John Ellis, Flashgear and 2 others like this. 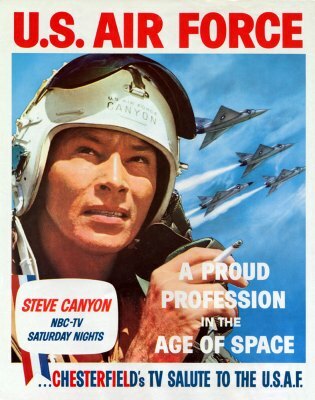 Congratulations John on the completion of the STEVE CANYON (NBC 1958-59) DVD releases. I guess it gave some anxious moments to some as to the (uncertain) outcome. Now the next logical plateau would be a blu-ray release of the entire series. Something to (seriously) ponder if it hasn't already been considered and addressed. 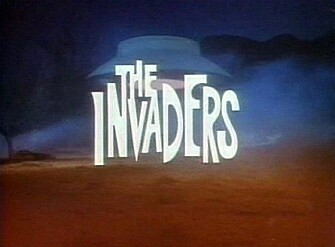 Help support a blu-ray release of THE INVADERS (ABC 1967-68) tv series starring Roy Thinnes. Let me correct something, Jeff. Steve Canyon was on NBC in 1958-59 and later rerun on ABC in 1960, so that's where you see promos for those ABC shows. Steve Canyon on Blu-Ray is probably not gonna happen. John Ellis can weigh in himself, but he did the entire restoration on his own, frame for frame. One guy. Packing, assembly and mailing...one guy. He's told the story himself here and on his website of how he put his health in serious jeopardy and is in dire financial straits. Delays and angry fans have not made it much easier. It's a struggle to sell DVDs, so a BD set wouldn't be a consideration. Best thing for fans of the series or of old classic TV shows to do is to buy the sets as they are. Speaking as a customer, I'm thrilled with the result. The picture and sound quality are amazing. Commentary is informative and fun while the period commercials are a wonderful addition, recreating the feel of watching the show back then. Honestly, it's a miracle the series was finished at all. His work is done, he deserves a rest. This series has been preserved and looks amazing. Buy a set and help him pay his bills. Regulus, Ron1973, John Ellis and 3 others like this. Regulus and John Ellis like this. Exactly. What John deserves is congratulations on a job well done and for giving us a legacy of a vintage series preserved in a way that most major studios wouldn't bother to do. The sad thing is how he was hounded and trashed unmercifully by people of small mind and no character or integrity whatsoever. Flashgear, JayHink, phenri and 2 others like this. Thanks Lou. Sales have been abysmal since I announced the factory disc-issue early last August, MANY (about a thousand!) that ordered V1 and V2 have so far not ordered V3…and my partner with the Terry disc passed away last April, and I don't know where the episodes/materials ended up, perhaps in the trash in New York…still hopeful but another "we'll see" situation. Thanks Jeff. With all the lying going on everywhere in todays world, many people just don't trust anymore…and I can't blame them. Actually only 20 of the 34 episodes were rerun on ABC in the summer of 1960…and 11 episodes were never repeated on NBC or ABC at all, getting only one showing ever in the USA. I wish it would have had a second season. Thanks Scott…there was a HUGE learning curve for me on this endeavor…and I was only supposed to restore the shows and oversee getting them back out to the public…but ended up getting forced to do everything when the smart thing would have been to just walk away…but I couldn't do that…higher standards must prevail. Thanks for your staunch support, my friend! Of the dozen or so people that were showering me with bile, 3 have apologized…and the others are probably wondering why they are so miserable and why their lives never work out. Apologies come from strength, not weakness, but that's a hard lesson for many to get. Also, I offered the series to Shout Factory three times: they never even responded once to say "no thank you". Flashgear, ScottRE, Ron1973 and 1 other person like this. John, I'm sorry you had to have that issue with the sales since then, because given all else I know that's happened you deserved a happier outcome than that. Given the poor quality stuff Shout has been willing to put out in the past, its amazing they weren't willing to take a crack on something in great quality and put out with higher standards than many of their releases have. Ron1973 and Flashgear like this. 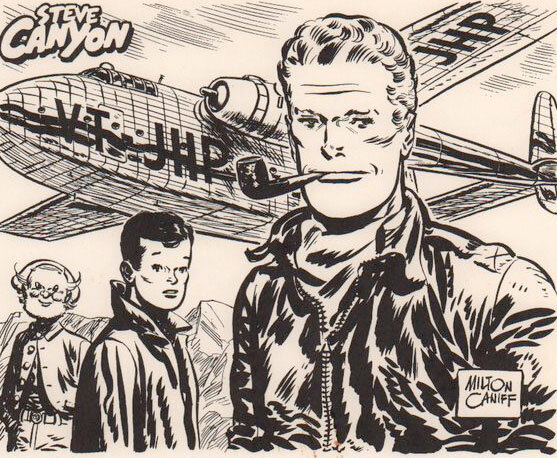 A friend that knows Shout said that they very likely didn't know what Steve Canyon was. and since they never heard of it, it wasn't important and hence not worth their time. I'm thrilled to announce that in a little over a week, on early Tuesday May 22 during Decades TV's “Lost Television” 2 hour block, Steve Canyon will begin airing on american television for the first time in nearly 58 years…at 2am Pacific time / 5am Eastern time, starting with the very first episode “Operation Towline” and continuing 5 days a week (Tuesday am through Saturday am), in the order they were made in, AND with closed-captioning for the hearing impaired! John Ellis, John Sparks, Jeff Flugel and 2 others like this. I'm so glad that I purchased the complete series on disc when Mr. Ellis first offered them for sale. John Ellis, Rodney, Flashgear and 2 others like this. Me too! 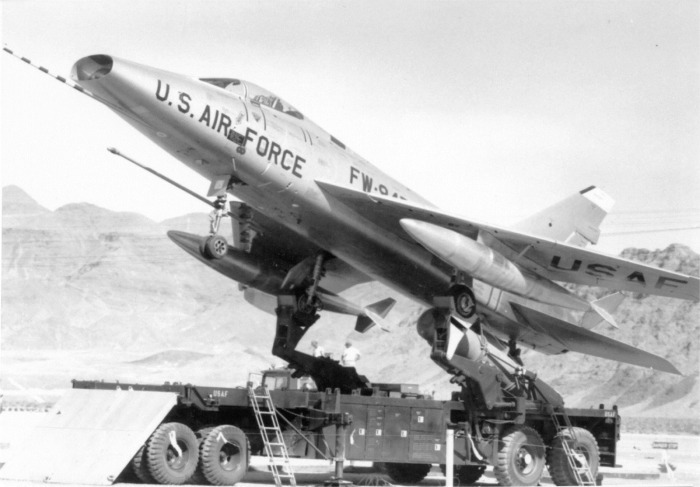 Steve Canyon is a wonderful adventure series and an unparalleled showcase of USAF and SAC hardware in the late '50s Cold War era...and sometimes quite shocking in unexpected ways as in the phenomenal episode "Operation Intercept" (ep28, Mar. 31, 1959)...a grim drama that you just wouldn't expect network censors of those days to sign off on, let alone the USAF themselves! And as with so many episodes on this unique and extravagant set, you get commentaries by director Arthur Marks, along with TV historian Peter Greenwood and John Ellis himself for this episode. There are commentaries for nearly all 34 episodes of the 3 volumes. Actors who appeared in the episodes are also found in these commentaries...Richard Anderson, Russell Johnson, Marion Ross, Abel Fernandez, Morgan Woodward, Bob Hoy and Sylvia Lewis. 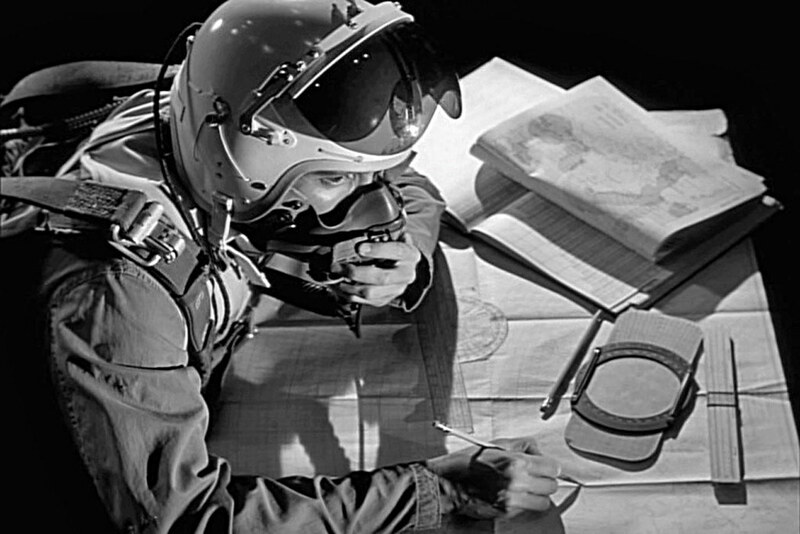 Aviation Historian James H. Farmer provides expert info on the airplanes and technology. And Film maker and Nuclear Weapons historian Peter Kuran (his phenomenal Oscar and Emmy honored documentaries Trinity and Beyond, Nukes in Space, Atomic Cafe etc., Feature films RoboCop, Gremlins, Starship Troopers, Star Trek, Star Wars, etc., the guy has worked in FX for 40+ years) provides more insight to the Cold War Nuclear Weapons brinkmanship of those days. And if that isn't remarkable enough, Composer Nathan Scott (Gunsmoke, Twilight Zone, Color Purple, etc.) 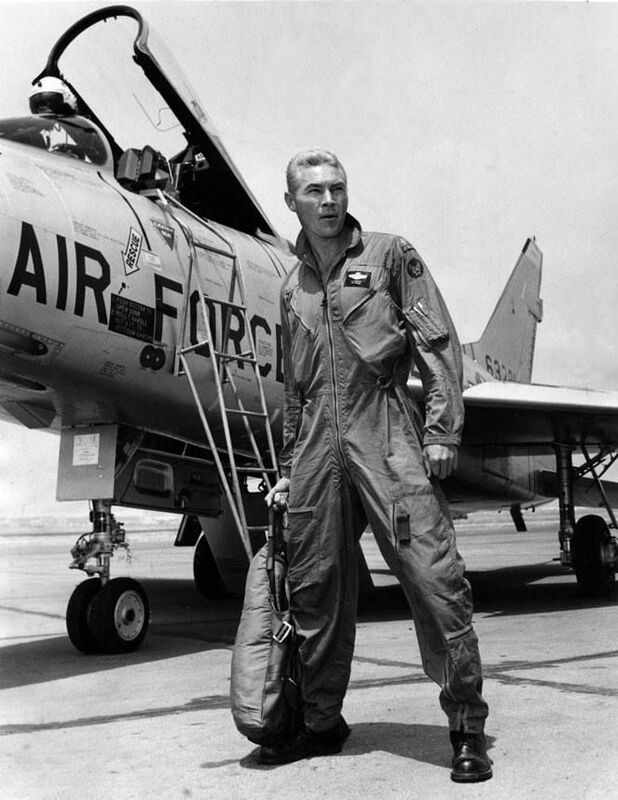 provides a commentary track on the episode "Operation Thunderbirds" (ep3, Sept. 20, 1958)...alongside his son, Tom Scott, himself a famous Jazz Fusion Saxophonist! (I'm a big fan). 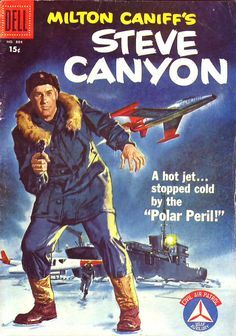 James Drury, Julie Adams, Mary Tyler Moore, Roy Thinnes, Werner Klemperer and many others are in other episodes of Steve Canyon. I'm glad that Decades is giving them an airing for the first time in nearly 60 years...but real fans will want to buy the DVD sets for their deluxe and extraordinary presentation...and to hear the valuable commentaries too. And support John Ellis for this labor of blood, sweat and tears. 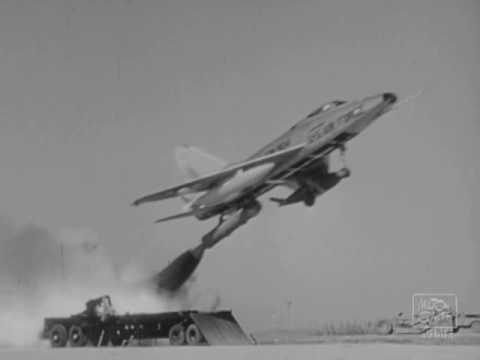 The incredible but real F100 Super Sabre on the JATO (Jet Assisted Take Off) launcher as seen in episode 2, "Operation Zero Launch", Sept, 20, 1958). 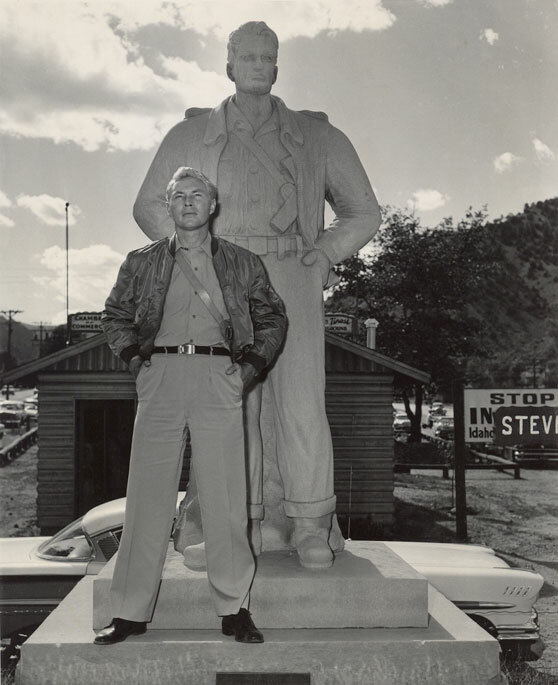 Dean Fredericks at the Steve Canyon monument to creator Milton Caniff at Idaho Springs, Colorado...not far from the USAF academy, dedicated in 1950. Brand new '58 Pontiac chrome behemoth in the background. 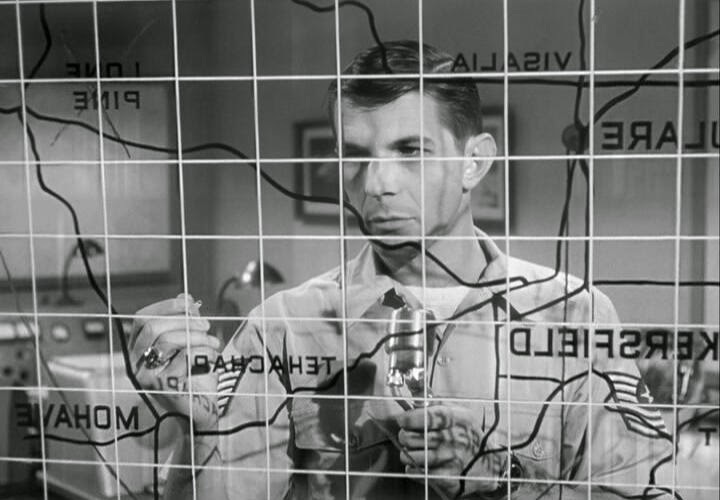 Leonard Nimoy in episode 18, "The Search" (Jan. 15, 1959). 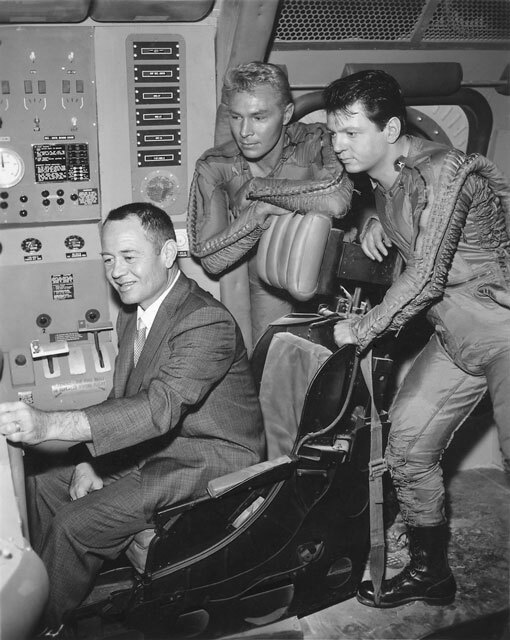 Real WW2 Medal of Honor fighter ace Gregory Boyington (Baa, Baa, Blacksheep) on the Steve Canyon set with Dean Fredericks and Richard Weber in high altitude pressure G suits. Dean Fredericks with Steve Canyon creator Milton Caniff and former president Harry Truman! John Ellis, ChrisALM, Ron1973 and 3 others like this. I find it funny when people are now wanting to get this series on blu-ray. Bear in mind when this series was first aired nobody envisioned the kinds of televivion sets people would be watching on TV these days. Big-screen TV and VCRs didn't make their debut until the 1970's (and they cost a king's ransom when they first made their debut! ) and DVD players weren't available until the 2000s. We can be thankful this series came out at all. John Ellis, ChrisALM, Ron1973 and 2 others like this. I find it funny when people are now wanting to get this series on blu-ray. Bear in mind when this series was first aired nobody envisioned the kinds of televivion sets people would be watching on TV these days. Big-screen TV and VCRs didn't make their debut until the 1970's (and they cost a king's ransom when they first made their debut! ) and DVD players weren't available until the 2000s. We can be thankful this series came out at all at all. Personally, I'm more than happy with the quality of the DVDs. However, John did such a good job cleaning up the elements that one can easily see that the potential is there for being able to produce a quality blu-ray release. Unfortunately, the return on investment is probably not. John Sparks, John Ellis, Flashgear and 2 others like this.